The aroma of fresh herbs, the sound of laughing women trying to sell their food and colorful snacks being displayed in the market stalls, ready to be eaten. The Gwangjang Market in Seoul, not far from Dongdaemun, is the oldest traditional market in South Korea and heaven on earth for foodies. Today I’ll show you why. 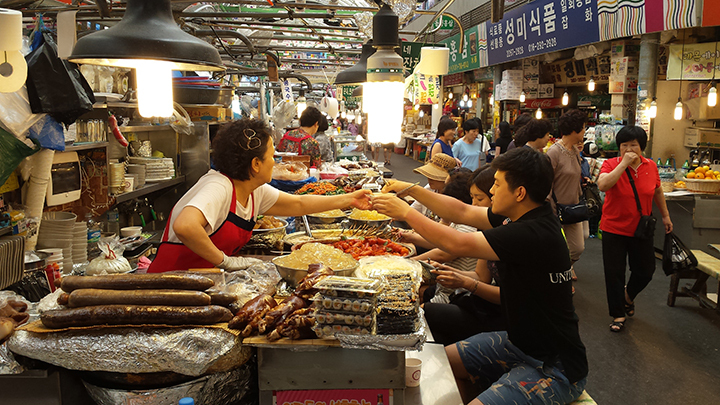 When I was planning my trip to Seoul, I dotted ‘going to the Gwangjang Food Market’ on my list first. I had visited the market in 2012 and I remembered the great atmosphere and the wonderful food. I love local markets and I love food, so I quickly figured out I had to go back. Since I’m not much of a planner and usually book things out of enthusiasm it wasn’t until I checked in to my hostel that I discovered the Gwangjang Market was within walking distance. That’s what I call ‘winning in life’! 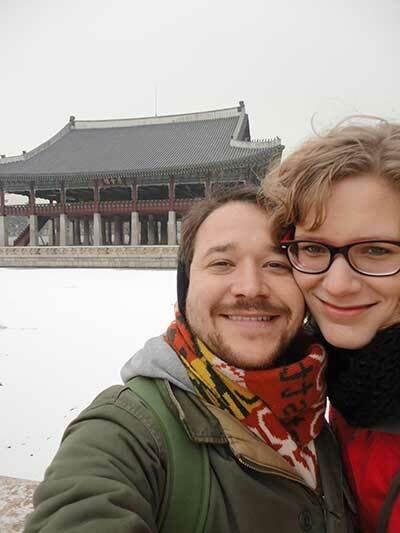 You’re not saying too much when you’re calling the Gwangjang Market in Seoul an old friend. The Gwangjang Market is over 100 years old and the oldest market of South Korea. The market was first opened in July 1905 after wealthy merchants decided to start a new market that would not be ruled and controlled by the Japanese. The merchants started to collect money and eventually bought the land where the market is located. The Gwangjang Market consists of 2 floors with over a 1,000 shops selling all kinds of things. 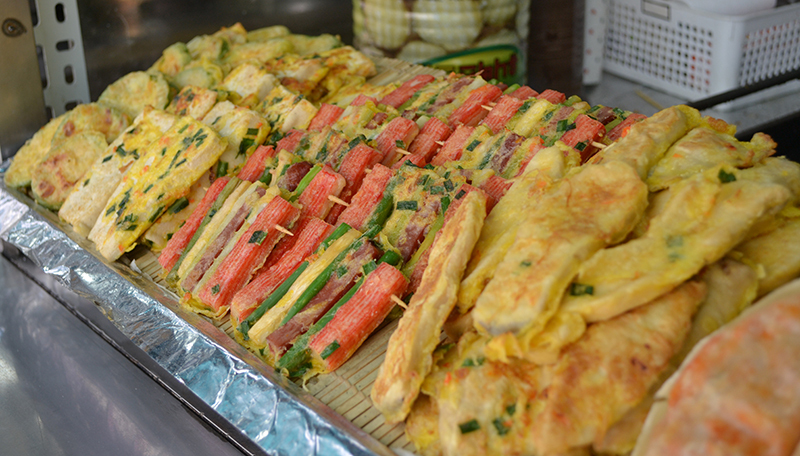 On the ground floor you will find all the food stalls selling typical Korean snacks like kimchi and bindaetteok. On the first floor you will find shops selling silk, satin and bed sheets. Needless to say I stayed on the ground floor, wandering around and wondering where to eat. 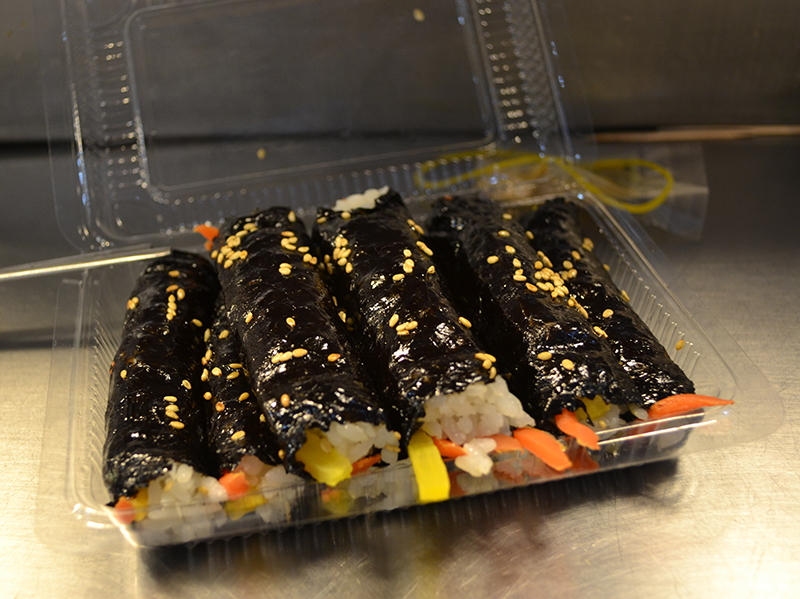 Gimbap is super popular in Korea and available in almost every restaurant. This snack originated from Japan: the Japanese soldiers brought this snack (tekkamaki in Japanese) with them during the Japanese occupation of Korea (1910-1945) and that’s how the Koreans were introduced to this snack. It looks like sushi, but instead of being filled with fish (although there are versions with fish), they are filled with egg and veggies. All kind of veggies! Fresh ones, pickled ones or grilled, it’s all possible! To make the gimbap even better, you put some sesame seeds on top and dip the rolls in a sesame sauce and you’re good to dig in! Who doesn’t love fried food? Each and every country has its own fried snack (this is the Dutch snack). 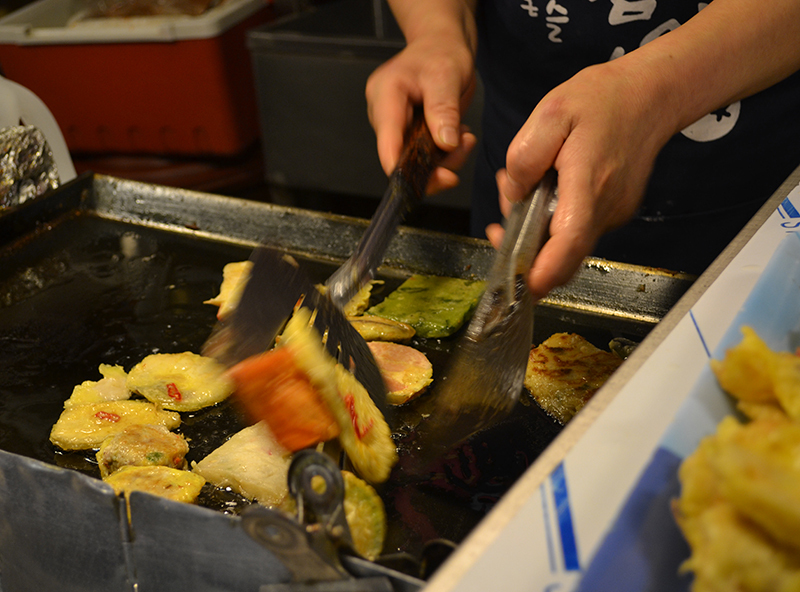 Although fried snacks are not the healthiest, they often do taste good. And sometimes that’s what’s most important, right? It’s no different in Korea. While I was strawling over the market I saw a lot of food stalls selling twigim and therefor I had to taste it. Twigim is somewhat similar to tempura, but I think tempura is a lot crispier than twigim is. When I got my order I had some veggies on my plate, but also a few sausages and pieces of fish. The veggies were super tasty, but the meat and fish not so much. 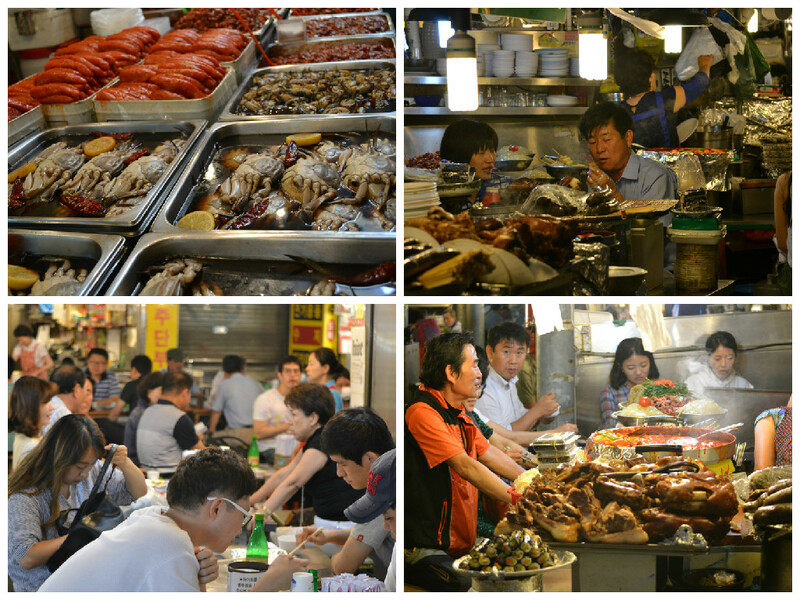 The are many different dishes to choose from at the Gwangjang Market in Seoul and that makes the market a place you really can’t skip. Especially when one of the reasons you are traveling is to eat local food. 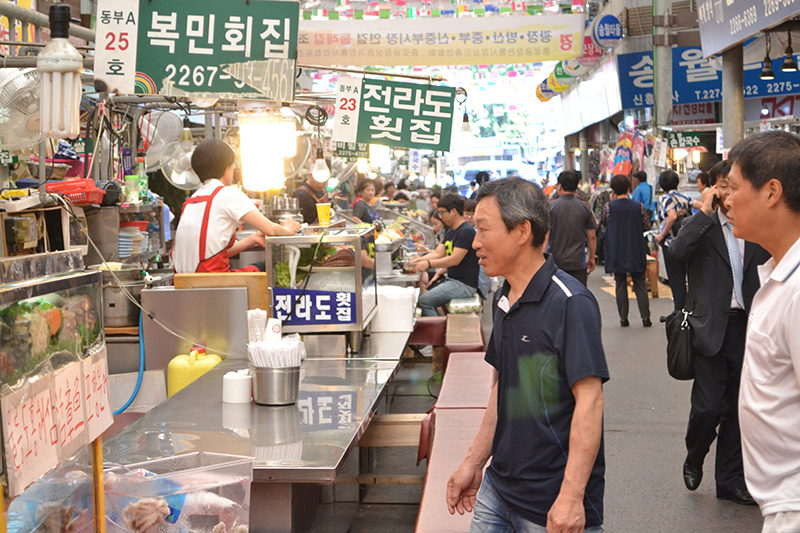 Besides the wide variety of dishes one can eat at Gwangjang, the market is also very budget friendly. So even when you accidentally buy somethings that you think is really bad there won’t be any reason to be sad. Just go to the next stall and try again. 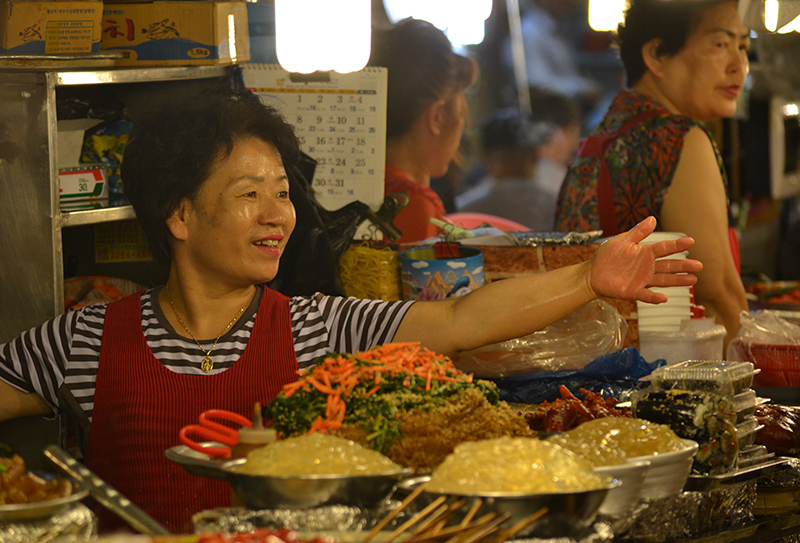 The Gwangjang Market (the food stalls) is open from 10 a.m. until 9.30 pm. It’s best to visit the market in the evening as there will be more people and you most likely will have a better experience.